A 92-year-old man who shot his son in the head as he slept in his father’s Old Town residence pleaded guilty Wednesday to voluntary manslaughter and is expected to avoid prison time. 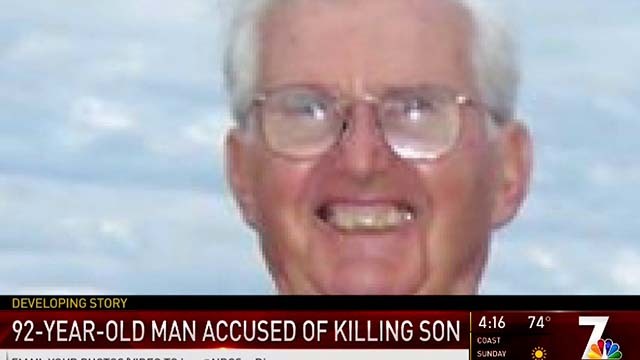 Richard Landis Peck had been facing a murder charge in the death of his 51-year-old son, Robert, who defense attorneys and Peck’s friends said was abusive to his father. Defense attorney Doug Gilliland said that under the terms of the plea agreement, Peck will be sentenced March 28 to three years probation and placed under house arrest. The nonagenarian was arrested the evening of Nov. 14, after going to a neighbor’s house in the 2300 block of Juan Street and telling her that he had just shot his son, according to police. Officers arrived moments later and found the victim dead in his father’s residence. Gilliland alleged in previous court hearings that his client’s son was an alcoholic who was psychologically abusive toward his father, while the elder Peck was described in letters written to the court by friends as a “kind” man and “quiet gardener” who had never been in trouble with the law. Robert “Robbie” Peck was going through a divorce and had moved in with his dad about three months earlier, Gilliland said. Within those 90 days, the defendant feared for his safety and called police twice, the attorney said. The defendant’s family had been trying to intervene for some time and were unsuccessful in trying to get Richard Peck to spend some time away from San Diego in Athens, Georgia, Gilliland said. The attorney said Richard Peck told family members that his son was trying to make changes to his will.